The L-band AESA designed for embedding in the inboard leading edge of a fighter wing was perhaps the most interesting single disclosure from the MAKS 2009 event in August, 2009. Tikhomirov NIIP's marketing material for this product describes it as intended for the “Su-27 (30) and Su-35 family of aircraft” thus presenting it as a component for new build aircraft and retrofit to existing fleet aircraft. Depicted the second Su-35S prototype B/N 902 (KnAAPO image). Tikhomirov NIIP in Moscow are developing an L-band AESA radar system intended for embedding in the leading edges of fighter wings. A demonstrator of the L-band AESA subsystem was publicly displayed at MAKS2009. This paper analyses the operational potential of this design, and performs a range of performance estimates based on manufacturer disclosures and known design features. Search, track and missile midcourse guidance against low signature aircraft. Identification Friend Foe / Secondary Surveillance Radar. Passive angle tracking and geolocation of JTIDS/MIDS/Link-16 emitters at long ranges. Passive angle tracking and geolocation of L-band AEW&C/AWACS and surface based search radars at long ranges. Passive angle tracking and geolocation of hostile (i.e. Western) IFF and SSR transponders at long ranges. High power active jamming of JTIDS/MIDS/Link-16 emitters. High power active jamming of satellite navigation receivers over large areas. High power active jamming of L-band AEW&C/AWACS and surface based search radars at long ranges. High power active jamming of guided munition command datalinks over large areas. Performance modelling for a range of feasible configurations indicates the radar will deliver tactically credible search range performance. The Tikhomirov NIIP L-band AESA is an important strategic development, and a technology which, once fully matured and deployed in useful numbers, will render narrowband stealth designs like the F-35 Joint Strike Fighter and some UAVs, highly vulnerable to Flanker variants equipped with such radars. Much of the media focus at the MAKS 2009 event this August was directed at the X-band AESA design produced by Tikhomirov NIIP, Russia's leading fighter radar house, intended for use in the new T-50 / PAK-FA fighter and the T-10 / Su-27/30/35 Flanker fighters. Very little attention was paid to Tikhomirov NIIP's new L-band AESA design, developed for embedding in the inboard leading edge flaps of the T-10 / Su-27/30/35 Flanker fighter family. This is unfortunate, but also not surprising, since Tikhomirov NIIP have disclosed very little about the intended uses of this radar, and its intended performance and capabilities. The development of this radar has been discussed publicly in the Russian technical press for some time now, but it has attracted very little attention in the global defence debate. The L-band, which in Russian usage typically refers to frequencies between 1.0 GHz and 2.0 GHz, with wavelengths between 0.3 metres and 0.15 metres, is heavily populated with common services as well as being a favoured band for long range search radars. Services operating in the L-band include JTIDS/MIDS/Link-16, military IFF and civil SSR transponders, Navstar GPS, Galileo and Glonass satellite navigation, and a range of guided weapons datalinks. The band is also used for some satellite communications uplinks and downlinks. The NG MESA active array AEW&C/AWACS radar developed for the E-737 / Wedgetail, the Israeli Elta EL/M-2075 Phalcon AESA radar used in the Indian A-50I AEW&C/AWACS and the EL/W-2085 used in the G550 hosted AEW&C aircraft, as well as the Chinese KJ-2000 and KJ-200 AEW&C/AWACS radars, all operate in the L-band. Russia's 59N6 Protivnik GE series and 67N6 Gamma DE AESA series long range mobile search radars also operate in the L-band. Why has the L-band been so popular? With operating wavelengths of the order of 6 to 12 inches, it permits good long range search performance with modestly sized antennas, while providing excellent weather penetration, and reasonably well behaved ground clutter environments compared to shorter wavelength bands. In airborne radar applications, L-band offers an additional economy, as a single L-band design can combine conventional primary radar functions with secondary IFF/SSR functions, thus saving considerable antenna and transmitter/receiver hardware weight, cooling and volume. The latter are alone sufficient reasons to employ this otherwise heavily congested band. Another less frequently discussed consideration is that L-band frequencies typically sit below the design operating frequencies of stealth shaping features in many fighter aircraft and UAV designs. Shaping features such as engine inlet edges, exhaust nozzles, and other details become ineffective at controlled scattering once their size is comparable to that of the impinging radar waves. This problem is exacerbated by the skin effect in resistive and magnetic materials, which at these wavelengths often results in penetration depths incompatible with thin coatings or shallow structures. 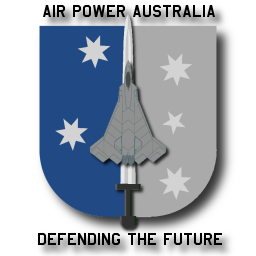 It was therefore not surprising that during the 2000/2001 Australian media debate over the Wedgetail AEW&C aircraft, US participants were quick to vocally argue the “counter-stealth” capability of the Wedgetail's L-band AESA radar design. Recently performed Radar Cross Section modelling and simulations performed on key shaping features of the F-35 Joint Strike Fighter show a pronounced degradation of shaping effects below the design's optimal X-band operation. Tikhomirov NIIP's uncharacteristic coyness about the intended uses of the L-band AESA design has not precluded other program participants from commenting. NPP Pulsar, who developed the RF transistor technology used in the radar's TR modules, and the quad TR module design, described the design as intended for “IFF, international SSR and search radar functions”. 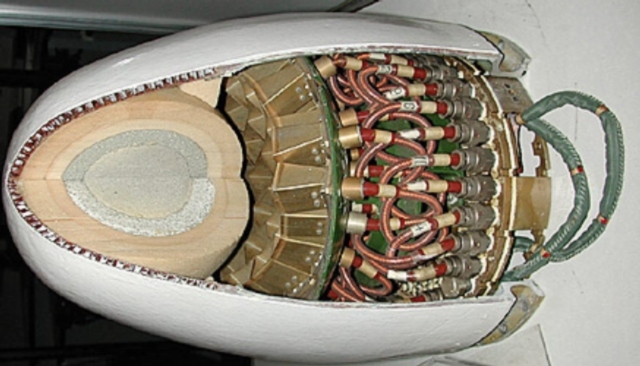 For a dedicated IFF/SSR role, the Tikhomirov NIIP L-band AESA would simply represent gross “overkill” in performance and angular coverage, which is not characteristic of Russian design philosophy, nearly always focussed on the full exploitation of the technological potential of each design component. The Pero PESA design developed by Tikhomirov NIIP for upgrades to legacy Flanker N001V series radars is an interesting example, as it combines a reflective X-band array for search functions, and an embedded transmissive L-band array for IFF/SSR functions. The “traditional” approach to IFF/SSR integration in both US and Russian planar array MSAs has been to fit one or two rows of L-band dipoles on the face of the antenna. 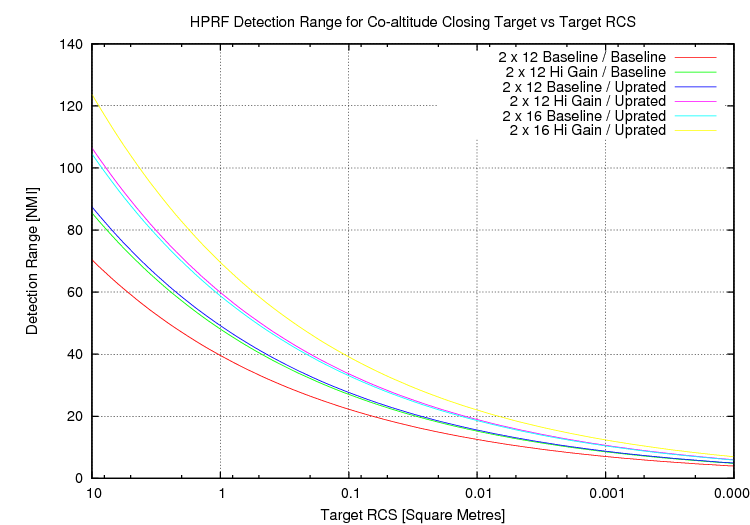 Power aperture performance or angular accuracy has tended not to be a high design priority in IFF/SSR applications, as the targets are cooperative, and use active transponder beacons. Skin return is not a consideration in IFF/SSR application performance. The volume, weight, power, cooling and cost penalties of putting an L-band search radar on a fighter have historically precluded the use of this band in fighter applications. An X-band or Ku-band radar provides for greater accuracy, and vastly better antenna directivity, given the available geometries for installing radar antennas. The only reason to pursue the L-band is thus if it can do something which cannot be done easily in the X/Ku-bands. That something is inevitably the ability to produce useful skin returns from targets which are difficult to detect and track in the X/Ku-bands. Embedding an IFF/SSR function in the design simply increases the design payoff, as a single design can perform two functions, interleaving IFF/SSR interrogation messages with target search pulse trains. This is nothing less than the “shared multifunction aperture” model now very popular in the design of Western X-band fighter radars, examples including the Raytheon APG-79 and NG APG-81. Many of these functions can be integrated into the design without great difficulty, in part due to the modest number of antenna elements used in an L-band design, and in part because the demands in digitising, synthesizing, and processing lower band waveforms are much less technically challenging than in the X-band or Ku-band. The Tikhomirov NIIP L-band AESA design is an important first step in developing the full technological potential inherent in an L-band multifunction aperture design, and once fully integrated and matured on the Flanker airframe, this design is likely to be become the vehicle for progressive incremental addition of further capabilities over time, a deployment model increasingly popular in modern Russian designs, and widely practiced in the West. The effectiveness of the design in any of its intended or potential roles will critically depend upon how well the AESA has been designed. Power-aperture product performance will be especially important in Counter-VLO search/track roles, and any active jamming roles. Performance modelling for a range of feasible configurations indicates this radar will deliver tactically credible search range performance. 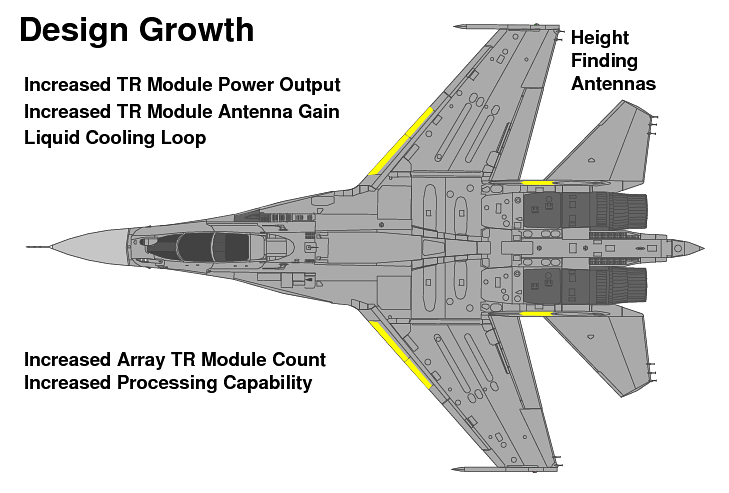 Radiofrequency power output will not be a major technological problem longer term, given the increasing availability of Gallium Nitride commercial and military radio-frequency power transistor technology, and the size of the Flanker airframe which permits the integration of effective liquid cooling systems without great difficulty, a major design problem with smaller fighter designs. Critics who might choose to dismiss the importance of the Tikhomirov NIIP L-band AESA should carefully consider the very significant performance and growth potential of such designs even in the short 2010 - 2015 timescale. NPP Pulsar have been very active in Gallium Nitride technology with numerous publications in Western research journals and conferences. In summary, the Tikhomirov NIIP L-band AESA is an important strategic development, and one which has the potential, once fully matured and deployed in useful numbers, to render narrowband stealth designs like the F-35 Joint Strike Fighter or some UAVs, highly vulnerable to Flanker variants equipped with such radars. It is a classical case study of lateral technological evolution, and smart technological strategy, a game Russia's defence industry plays exceptionally well. 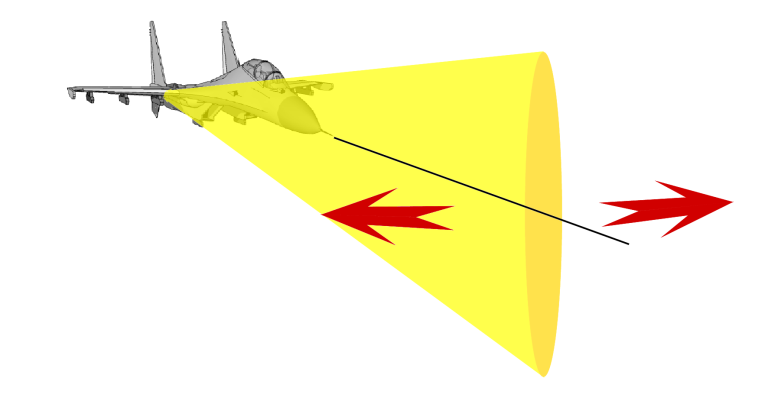 General layout of the Tikhomirov NIIP L-band AESA radar antenna design, in the leading edge flap of an Su-27 Flanker aircraft (Tikhomirov NIIP). Performing an exact and detailed technical analysis of any new radar design, in the absence of detailed technical disclosures, always presents interesting challenges. The L-band AESA is no exception in this respect, moreso since there are no direct Western or Russian equivalents to compare it against. Therefore any analysis must be performed from first principles, using established design theory for antennas, AESA technology, and pulse Doppler radar. 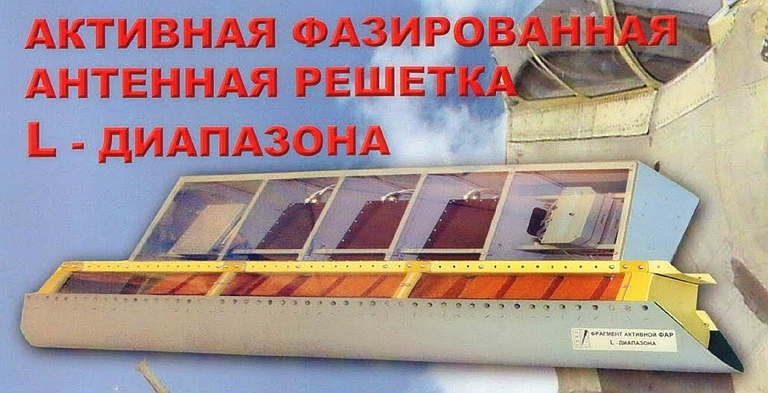 The basic array design and integration into the leading edge flap structure are well documented via a wealth of imagery produced at the MAKS 2009 event. Each array employs twelve antenna elements. Three quad TR modules each drive four antenna elements, for a total of twelve elements per array, in three subarrays. The linear array is embedded in the leading edge of the wing flap, with the geometrical broadside direction normal to the leading edge. The leading edge skin of the flap covering the AESA is a dielectric radome which is conformal with the flap leading edge shape. Figure 1: The array geometry produces a fan shaped mainlobe which is swept in azimuth by phase control of the twelve TR modules, providing a 2D volume search capability (Author, Flanker diagram Marco Falkenberg). As the array is only one element deep in height, the angular coverage it provides in elevation will be fixed, and determined by the vertical mainlobe shape of the antenna elements. The arrangement of the AESA produces a fan shaped beam which is swept in azimuth to cover a volume in the forward hemisphere of the aircraft. Refer Figure 1. 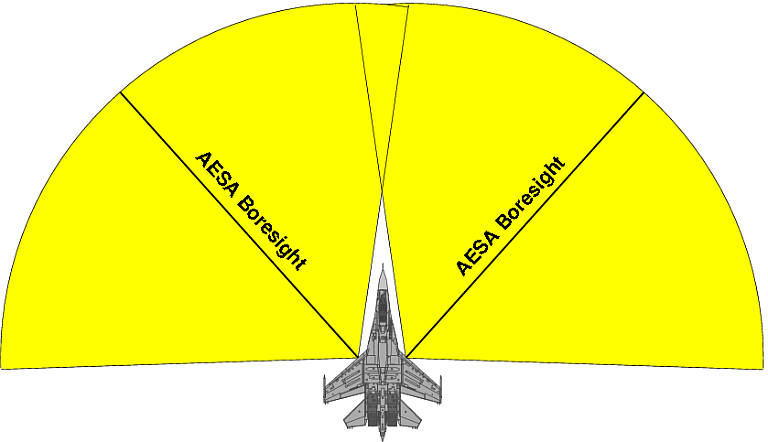 The achievable geometrical angular coverage in azimuth for the placement of the AESA on the airframe is depicted in Figure 2. Figure 2: AESA geometrical field of regard, assuming a mainlobe beam steering angle of ±50° off the array boresight. Single plane monopulse precision angle tracking is feasible in the volume covered simultaneously by both arrays (Author). Whether the AESA can actually sweep the full volume which is geometrically available depends primarily on the mainlobe shape and boresight direction of the antenna elements, which has yet to be disclosed. As the imagery of the antenna elements conceals the internal structure under a dielectric cover, at best we can make reasonable assumptions about the design. The most likely technology employed is that of a microstrip antenna with a dielectric foam or air gap spacer, forming a sandwiched block. This technology has been used extensively in L-band designs for communications and satellite navigation, as it affords precision control of characteristics and relatively low fabrication cost, with good repeatability in production. This technology would also permit precise shaping of the mainlobe in both axes and control of element sidelobes. There is an inherent tradeoff in such a design. Elements with higher gain will impose restrictions on bandwidth, and in beamsteering angle. The latter is critical in this application, since wide beamsteering angles in azimuth dictate a wide radiation pattern in azimuth. The element mainlobe angular width must be greater than the maximum beamsteering angle, or significant loss in total array gain will occur as the AESA mainlobe is steered into the region where element gain falls off rapidly with azimuth angle. In operational terms, the AESA must be capable of sweeping the volume in front of the aircraft's nose, either in IFF/SSR, search or jamming applications. The physical alignment of the array is with the leading edge of the wing, at ~42° for the Flanker airframe. This permits two possible design strategies for the antenna elements. The first is to employ very low gain elements, with a mainlobe 3 dB width in azimuth well in excess of the beamsteering angle required to cover the nose region. This angle would be of the order of 55° to 65°, beyond which grating lobe and other problems tend to be inevitable. This design approach provides the best possible angular coverage, effectively the full forward hemisphere. However, it also drives up the emitted power requirement for any given detection range performance, as the total array gain is reduced. An alternate strategy is to sacrifice total angular coverage to increase total array gain, and thus maximise power-aperture product achieved for a given TR module power rating. If the AESA is intended to provide significant detection performance operating as a radar, this is the preferred strategy. Implementing this strategy requires some trade-off between total beamsteering angular coverage of the array versus the per-element gain. This will be discussed further. Both design strategies permit single plane monopulse angle tracking within a narrow angular volume around the nose of the aircraft, where a target is within the coverage of both the left and right wing mounted AESAs. This is an operationally acceptable arrangement as the precision angle tracking provided by monopulse operation is employed primarily for weapon targeting. This does not preclude performing single plane monopulse angle tracking within each of the AESA arrays, using the subarrays, but affords higher total gain and detection range performance. Provision of a 3D tracking capability is more difficult in the absence of any vertically displaced antenna elements in the arrays. However, if we assume that such a capability is only required for targets directly in front of the aircraft to produce a fire control solution, two options are available. 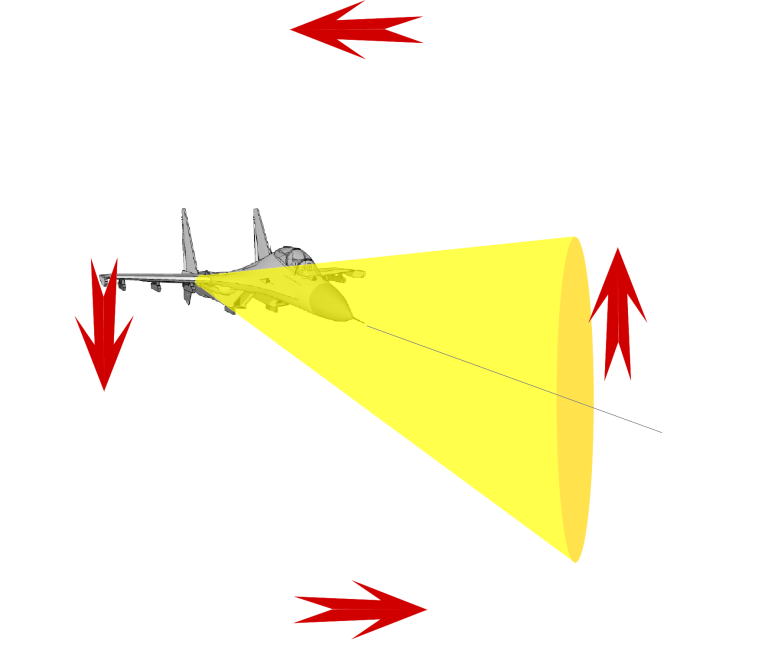 Figure 3: The cheapest solution to the provision of a heightfinding capability is to point the aircraft nose at the target, and then perform an aileron roll manoeuvre while tracking the target, with resulting height resolution similar to azimuth resolution (Author, Flanker diagram Marco Falkenberg). Figure 4: The more expensive but also more capable solution to the provision of a heightfinding capability is to add additional antennas on the vertical tails. This solution permits continuous height measurement of targets within the coverage of these antennas (Author). The cheaper option, with inherent limitations, is for the aircraft to fly an aileron roll manoeuvre whenever a height measurement of the target is required. A full 360° roll sees the target position measured through a full 2π angular extent, per manoeuvre. Whilst cheaper, this approach is not suitable for continuous tracking, and could present issues with clutter handling. Refer Figure 3. The more expensive approach, which is suitable for continuous tracking, is to add an additional high gain receive antenna suite, which is vertically displaced relative to the plane of the aircraft's wing, and thus the AESA. Such an antenna could be integrated into the leading edge of one or both of the vertical tails of the Flanker with no difficulty. Phase alignment of the monopulse sum and difference signals produced by the wing and tail arrays could be readily achieved by inserting a delay line between the wing array outputs and the sum/differencing network. Refer Figure 4. As noted earlier, exact analysis of antenna performance and coverage will have to await more detailed technical disclosures by the manufacturers. Figure L-band AESA general layout (Tikhomirov NIIP). L-band AESA leading edge flap installation on Su-30MK airframe (Tikhomirov NIIP). L-band AESA quad radiator element subarray (Tikhomirov NIIP). 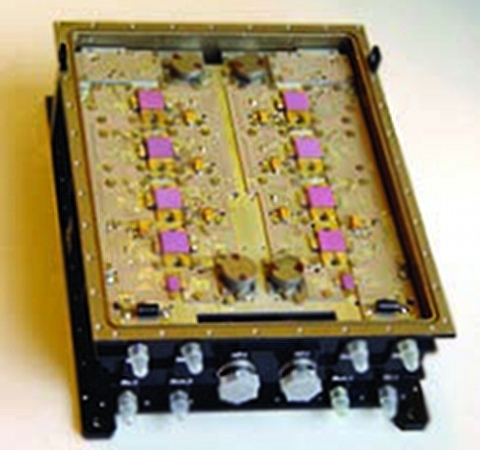 NPP Pulsar quad high power L-band TR-module used in the L-band AESA design. Note the use of eight RF power transistors in the design (NPP Pulsar). 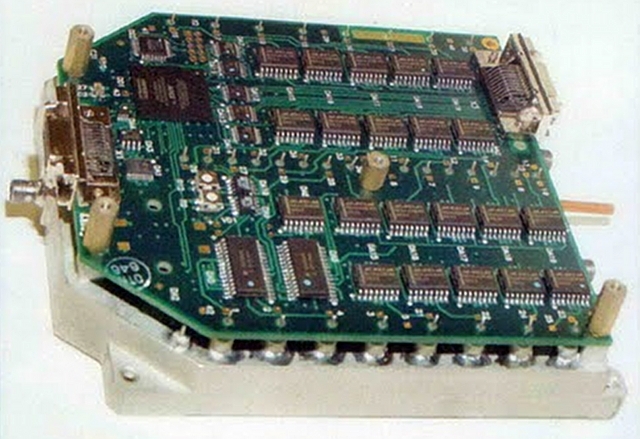 NIIP antenna control module for the L-band AESA (Tikhomirov NIIP). The absence of exact performance characteristics for the antenna element design employed necessarily constrains any estimation of detection range performance. This is compounded by the absence of any detailed description of the intended radar waveform and other cardinal design parameters. As a result all performance analyses must be based upon reasonable assumptions about the design strategy intended, in turn based upon reasonable assumptions of what performance and capabilities might be required for the design to be effective. To produce a representative performance estimate it is necessary, to a large degree, to produce a basic radar design definition and performance model which fits the parameters which are known. The simplest strategy for NIIP to pursue in designing a pulse Doppler radar RF and processing subsystem for the L-band AESA is to adapt an existing design, an evolutionary model frequently used by Russian designers. It is likely that the N035 Irbis E is being used for this purpose with the new X-band AESA design. Once such a radar exists, adapting it for use with an L-band AESA would involve only modest engineering effort. Longer term an operational design would likely emulate the US “Dual Band Radar” design strategy employed in the DDG-1000 weapon system, with separate L-band and X-band AESAs, using separate optimised power supplies and RF components, but sharing common central digital signal processing and data processing subsystems. In an airborne application where weight and volume are real problems, this is arguably the optimal strategy. TR module frequency band coverage between 1.0 and 1.5 GHz. TR module volumetric power density of 2 kiloWatts/litre. TR module nominal power rating of 200 Watts per TR channel, for a total of 2.4 kiloWatts per array, and 4.8 kiloWatts for a two array installation. These cited performance numbers need to be carefully qualified, as the manufacturer has also elaborated on the design of their Silicon RF power transistors intended for pulsed power applications such as L-band and S-band TR modules. 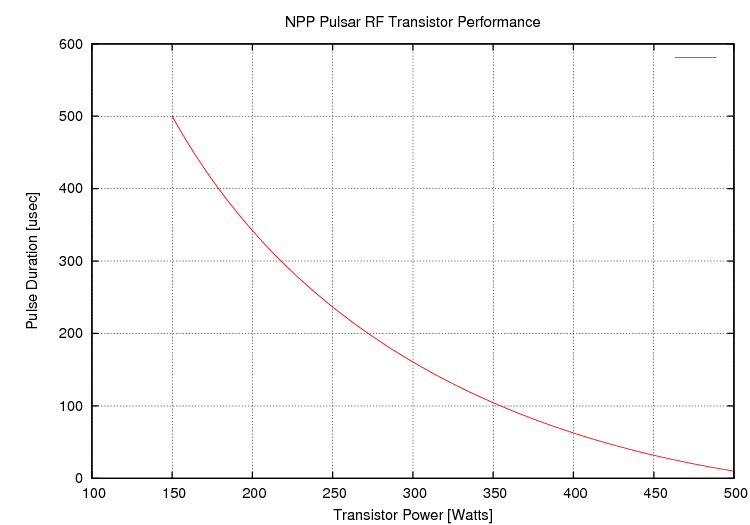 Specifically NPP Pulsar discuss the development of transistors rated to deliver 500 Watts for 10 μsec pulse durations at 1% duty cycle, 250 Watts for 100 μsec at 10% duty cycle, and 150 Watts for 500 μsec at 15% duty cycle. In practical terms this transistor design produces pulse energies of 0.005 Joules at 1% duty cycle, 0.025 Joules at 10% duty cycle, and 0.075 Joules at 15% duty cycle, favouring high duty cycle lower peak power operating regimes. In pulsed operation at 100 Watts, a duty cycle of ~18% and pulse duration of ~700 μsec appear to be the performance limits. The company already manufactures 1.5 kiloWatt rated liquid cooled TR modules for surface based radar applications, and solid state IFF/SSR transmitters rated at 3 kiloWatts. A number of these designs employed ganged transmitter stages, some with up to 64 solid state modules. The current Tikhomirov NIIP L-band AESA design does not appear to use a liquid cooling loop, given the absence of plumbing, and appears to employ conduction cooling to the airframe metal structure instead. This will inevitably limit the average power rating of the equipment, in comparison with a liquid cooled design. The exposed TR module image released by NPP Pulsar in late 2008 shows eight RF power transistors driving four antenna elements, which is consistent with a pair of transistors each driving 100 Watts into one element, with a maximum sustained duty cycle of ~18% for the stated transistor performance. For comparison, the liquid cooled solid state L-band TR modules developed a decade ago for the US NG MESA design were at the time cited at 1.0 - 1.5 kiloWatts per channel, whether the actual production design can deliver this peak power rating remains to be disclosed. With the existing Tikhomirov NIIP L-band AESA design using twelve TR channels per array, and a pair of arrays, the NPP Pulsar disclosure permits some estimation of nett AESA power ratings. The lower bound on the design is 2 x 12 x 200 Watts, for a total peak rating of 4.8 kiloWatts, with a duty cycle of ~18% and maximum pulse duration under 800 μsec. The design is likely operated in C class, although some cited Russian designs use A class or quasi-complementary AB class circuits. If we then assume each TR channel can produce one kiloWatt of RF power with more powerful ganged RF transistors with a total rating of 500 Watt / ~20% Duty Cycle, then this yields a rating of 2 x 12 x 1 kiloWatt for a total of 24 kiloWatts for a pair of arrays. The latter will require liquid cooling at any significant duty cycle. Table 1 shows examples of a number of representative L-band power transistors available commercially at this time. In comparison with X-band fighter AESAs, these are excellent numbers, but for an L-band AESA with a factor of ten or more lower antenna gain, are not necessarily stellar. The nett gain achievable by the each array element will depend strongly on the intended tradeoff between azimuthal angular coverage versus gain, but also upon the elevation coverage intended. For typical geometries of interest in air combat between fighter aircraft, an elevation coverage of +5° to -15° would permit acquisition of most targets of interest, resulting in a mainlobe width in elevation of ~20°. From an antenna design perspective, narrowing the mainlobe in elevation is a modestly challenging task. Design options include changing the aspect ratio of the microstrip radiating element, or introducing a graded dielectric lens element in front of microstrip element, the latter approach used in existing Russian electronic warfare equipment for phased array mainlobe shaping. Several estimations of element gain can be applied. The first is the simple rule of thumb estimate of ~6 dBi per element. If we assume a more refined design, with a mainlobe of 80° in azimuth and 40° in elevation, and apply Barton's approximation, G = 30,000/(θaz x θel), the element gain is ~9.7 dBi. Finally, we might assume a dielectric lens or more aggressive microstrip design, or some combination thereof, with an mainlobe size in elevation of 20°, which yields, again using Barton's approximation, an element gain of ~13 dBi. Sidelobe performance will be poor compared to X-band AESAs, due to the limitations inherent in a 12 x 1 element linear array. While an aggressive taper function could be applied, the low element count precludes very low sidelobe performance, even with concurrent element gain and phase control. Receiver noise figure performance for the L-band AESA should be excellent, due to the short feed between the TR module and antenna element, the potential for low loss integral directional coupler design, and typical transistor noise figures in the L-band of a small fraction of a dB. The effective noise figure is likely to be dominated by losses between the antenna and transistor, and of the order of 1 dB. Overall system noise temperature will be dominated by antenna noise produced by the environment. What choices in PRF, CPI, duty cycles and pulse compression technique Tikhomirov NIIP will opt for remains to be seen. Little has been disclosed on existing X-band designs to date, although public disclosures suggest that Barker codes may be in use for pulse compression. 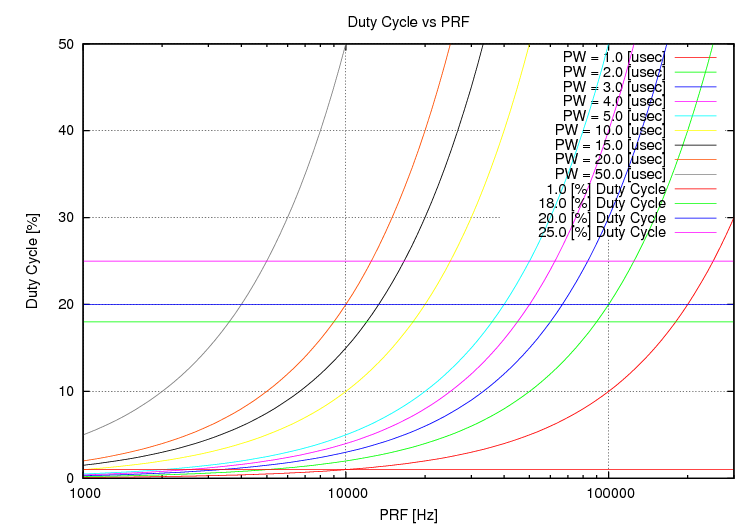 Open source data indicates that most operating modes in Russian pulse Doppler designs emulate those commonly used in US designs, with medium and high PRF modes commonly used. At least one Russian design is known to interleave medium PRF and high PRF regimes to maximise performance against concurrent mixes of closing and receding targets. Detection range performance in coherent pulse Doppler designs depends strongly on power-aperture product, but also on coherent integration time, PRF, duty cycle. Representative instances for typical radars summarised by Lynch (Skolnik 3rd Ed, 2008) were employed as cardinal parameters for modelling this design. If the intent of the design is to maximise detection range against closing low signature targets, then the design imperative will be to maximise the emitted energy per dwell, and minimise the noise bandwidth. This usually leads to the choice of a High PRF regime Velocity Search (VS) or Range Gated High PRF Range While Search (RWS) regime, or some interleaved combination of the two, with a maximum coherent integration time duration to maximise the coherent integration gain. While X-band radars have HPRF regimes at 100 kHz to 300 kHz, an L-band design will exhibit similar unambiguous Doppler at much lower PRFs, of the order of 25 kHz to 75 kHz, due to the four to six times lower operating frequency (Stimson 1998). In the cardinal co-altitude air to air engagement geometry for closing high speed targets at medium to high altitudes, the target Doppler will be well outside Mainlobe Clutter (MLC) and Sidelobe Clutter (SLC) which simplifies analysis. As the radar scans only in azimuth, the available dwell time per angle can be greater than in a comparable X-band search radar mode, thus minimising the dB loss incurred due to beamshape and scan considerations, another simplification to the model. A key consideration in such a regime of operation is that of how many pulses can be coherently integrated. This will be limited by the coherence length/time of the master oscillator employed, a parameter the Russians have not disclosed for any recent radar designs, and the Doppler filter bandwidth which is readily estimated. Noncoherent integration incurs up to several dB of loss in the integration of large pulse trains. Table 3 provides some coarse detection range performance estimates, based on parameters in Table 2. 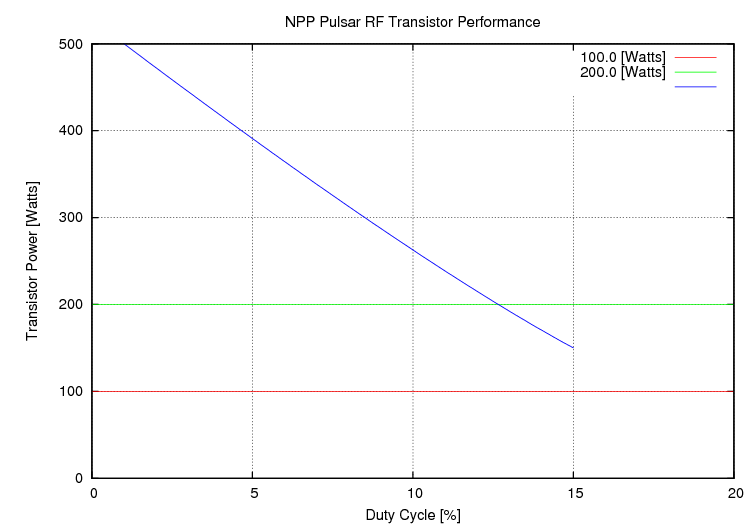 NPP Pulsar TR module @ 18.0 % D.C.
Configurations with uprated TR modules assume 500 W peak rated transistors at like duty cycle. The model is based upon a series of reasonable assumptions about the radar design, but in the absence of hard design parameters disclosed by Tikhomirov NIIP, these are only assumptions - the actual performance of radar could be considerably better or worse depending on specific design choices and implementation constraints, including factors such as the absence or presence of STAP processing, and choices in FAR, Pd, and other cardinal parameters. Detection range in nautical miles, RCS in square metres. Modelling of the radar's performance for a range of viable configurations shows detection range performance against 1 m2 class target to be tactically credible, especially for configurations with higher gain antenna modules and higher TR module average power ratings. This analysis is inherently limited by the poor availability of data covering the actual design, especially in terms of coherent processing parameters and other basic choices. By increasing dwell times and coherent processing interval durations, range performance could be further improved in this regime. 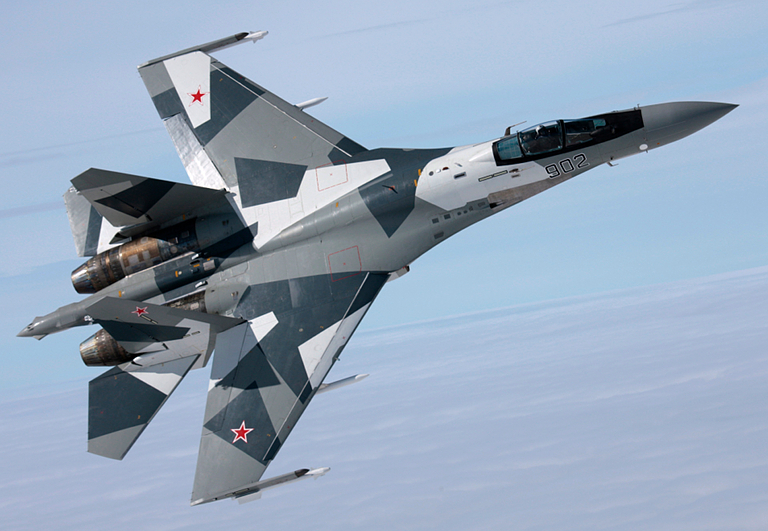 The Tikhomirov NIIP L-band AESA has considerable growth potential by virtue of the large size of the Flanker airframe, permitting additional antenna elements, cooling and power. Increasing the power rating of the existing TR modules, retaining conduction cooling. Further increasing the power rating of the TR modules and introducing liquid cooling. Improvements to antenna element design to increase element gain. Extending the arrays further along the wings, to add an additional one or two subarrays. Addition of receiver arrays in the leading edge of the vertical tails to provide dual plane monopulse precision angle tracking capability for fire control purposes. For instance, increasing the array size to 16 elements improves power-aperture product for the existing design by almost 80%, by virtue of additional gain and transmit power. The use of more powerful TR modules provides for further improvements. The practical limit will be the available leading edge flap volume as the design progressively tapers toward the wingtips, and system constrains on liquid cooling capacity. The author is indebted to all parties in Australia and overseas who reviewed the draft of this paper, for their cogent comments and input. Thanks also to Dr Nemai Karmakar of Monash University, for his most helpful advice on the design of microstrip antenna elements for active phased arrays, an area he has specialised in for nearly twenty years. Fred E. Nathanson, J. Patrick Reilly, Marvin N. Cohen, Radar design principles: signal processing and the environment, Second Ed, Scitech Pub., Mendham, NJ, 1999. Karmakar, N.C. Bialkowski, M.E., Circularly polarized aperture-coupled circular microstrip patch antennas for L-band applications, IEEE Transactions on Antennas and Propagation, Volume: 47, Issue: 5, IEEE, May 1999.